The class system is embedded in all of our lives and its not surprising that when we organise for social and environmental justice in our groups and networks that the same class oppressions are often perpetuated. This one day workshop aims to give space to reflect on our own experience of class, to build awareness of how class oppressions are reproduced in our groups and what we can do to change that, so that we can create stronger and more effective groups and movements for social change. 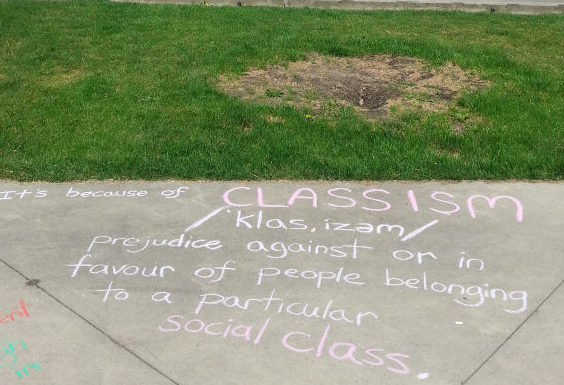 Class injustice (classism) is about barriers to accessing material resources (money, home ownership). Its also about social and cultural barriers to accessing education, jobs with decent pay and conditions, decent housing, where ‘what you know’ and ‘who you know’ provide greater access to resources. Some of these barriers are rooted in explicitly classist government policies and employment practices. Others are rooted in implicit attitudes, frequently fostered by the media, where unequal respect, trust and opportunities are given to people with different education levels, occupations, cultures, accents etc. The consequences of these barriers are enormous, yet they have become so ‘normalised’ that they are invisible. We will use a mix of large and small group activities, share personal class life stories and use class-based caucuses to explore our classed experiences, build awareness of how class oppressions are reproduced in our groups and explore ideas for practices we can implement in our groups to change that. We will also explore how class identity intersects with other aspects of our identities such as race, gender and ability. As facilitators, our approach is to create a learning environment which supports curiosity and care as we explore the impacts of classism together and share our lived experience of class inequality, without blame, guilt or shame. If you are working for social or environmental justice, paid or unpaid, whether you call yourself an activist or campaigner or not, we would love you to join us! The deadline for applications is 14th December 2018. Places are limited.